Once upon a time (~ A.D. 280) in Patara, there was a woman named Nonna. Although she and her husband Epiphanius were very well off and had many friends, something was missing from their lives. They wanted a family of their own, but found that they were unable to conceive despite their efforts. Being a pious Christian woman, Nonna turned to God. She prayed, “Remember me, and not forget thy handmaid, but wilt give unto thy handmaid a man child, then I will give him unto the Lord all the days of his life.” Nine months later Saint Nicholas was born. Legend has it that the child was a fast learner who prematurely learned to stand in his crib According to Simeon the Translator, the boy, “showed from the beginning that he wanted to please God.” Taken under the tutelage of his Uncle Nicholas, the boy proved himself to be an apt student with a pious devotion to God. Soon enough this God-given and well-respected boy would start sharing his own gifts. In the town there was a nobleman who had three daughters. Down on his luck, the nobleman found himself widowed, broke, and unable to provide a dowry for his daughters. As the first daughter became of age, she found herself faced with being “sold off” by her father either to a life of prostitution or slavery. As the family was lamenting their dismal situation, a bag of money came flying through the window and crashed on the kitchen table. Taken off guard, the father did not look outside in time to identify the family’s mysterious benefactor. Not long after her older sister found a husband, the second daughter came of age. Once again, the poor nobleman found himself unable to provide his daughter with a suitable dowry. Just as the family began to pine for the dismal fate of the second daughter, another bag of gold came flying through the window. Startled, the father ran out the door the attempt to learn the identity of the gift giver, but to no avail. With joy, the second daughter found a young man and the two of them married and were glad. But as time went on, the third daughter found herself without a dowry and with fears of a dark future. Once again, the family wept about their fate, and once again a bag came flying through the widow as it had twice before. This time the father caught the bag and ran hastily after the mysterious figure. Cornering him, the father discovered that the kind soul was Nicholas. Happy and confused, the father was astonished by the anonymous nature of Saint Nicholas’s actions. Only after the death of Saint Nicholas did the family reveal his generosity and kindness. Thus, did the oldest gift giving story of Saint Nicholas come to be revealed. Once upon a time, there were three Statilati (generals) named Ursos, Nepotianos, and Herpylion who were all loyal to the Great Emperor Constantine. When trouble fell upon the land with the revolt of the Phrygians in the South East, they set off to fight them in the name of the Empire and God. But as they sailed, storms howled and swirled and they were forced to bring their army-bearing ships to shore at Andriaki, the port of Myra. With little else to do, the soldiers wreaked havoc on the town with drunken brawls and depravity. It wasn’t long before the locals fought back against the titdal wave of mischief, causing the violence to spiral further and further out of hand. Saint Nicholas, the holy Bishop of Myra, soon caught wind of the trouble at the port. Wanting to keep the peace he sped down to Andriaki and addressed the three generals. “Who are your Excellencies, and what is your mission?” the Bishop asked. “Why we serve the Emperor as well as Your Saintliness! And it is by the order of the Emperor that we have come down from the North to stop the revolt within the city of Taiphalis in Phrygia. Due to sea’s storms we have been forced to land ashore and shall continue our voyage when the waters have calmed,” the general proudly replied. “You say that the Emperor has instructed you to bring peace. If that is so, then why is it that you have brought disharmony on our little town?” Saint Nicholas asked. “But our Lord Saint, who is it that brings unrest? !” cried the generals, taken by surprise and ignorant of their soldier’s misconduct. Once they were informed by Saint Nicholas, the generals disciplined their poorly behaved troops and returned the town to order. The army worked to repair the damages they caused and were forgiven by the town. Meanwhile, as the wrongs of the soldiers were being atoned for, Saint Nicholas invited the three generals to break bread with him at the Cathedral of Myra. As Saint Nicholas and the three generals were returning to Andriaki from the city of Myra, they beheld a multitude crying on the side of the road by one of the villages. The compassionate Saint Nicholas was moved by their tears and asked them why they were weeping. They told the saint that the execution of the three innocent men was about to take place at the center of the town. After the local villagers had confirmed the testimony of the morning relatives, the saint and the three generals hurried quickly to the center of the town. Getting there in the “nick” of time, Saint Nicholas grabbed the sword from the hands of the executioner right as he was about to behead his first victim! 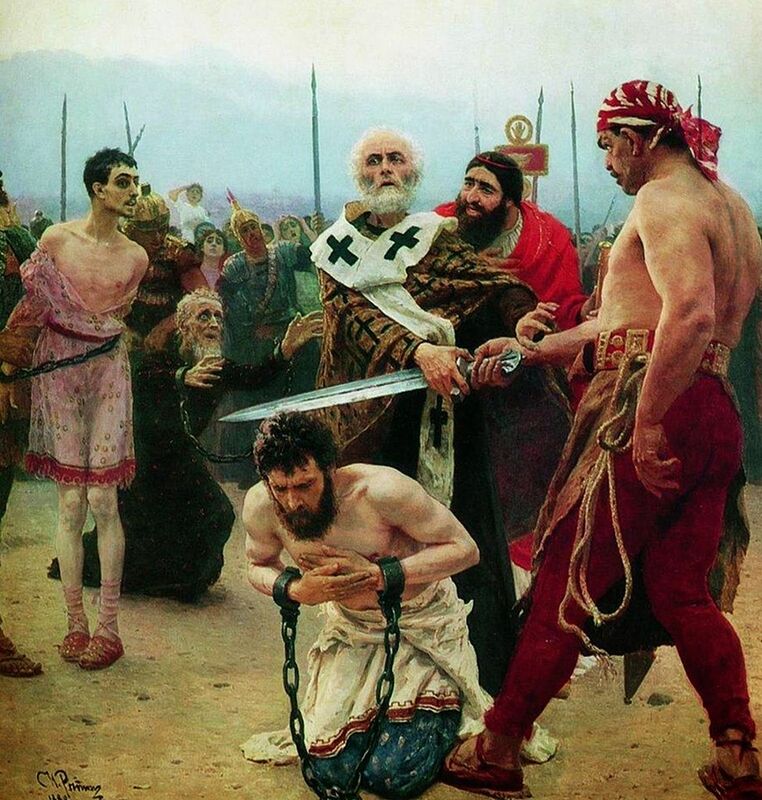 The Saint angrily untied the ropes that had bound the three falsely accused men. Hearing of what had just occurred, many poured into the center of the town; among them was the corrupt Prefect Eustathios mounted on his horse. Noticing the wicked man, Saint Nicholas scolded him for his actions, when at once the official admitted of being bribed by the town municipal leaders Simonedes and Eudoxios. The furious Saint informed the wicked men that the three generals accompanying him would inform the Emperor personally of their corrupt ways. The three generals Ursos, Nepotianos, and Herpylion “completed without bloodshed” their mission to stop the unrest in Phrygia. Overjoyed upon hearing the good news, Emperor Constantine gathered gifts for their return and promotions in rank to boot. But as the generals made their way up north, their envious rivals at the imperial court sought to foil their triumphant return. The adversaries of the generals told Evlavios, the imperial chancellor, that the generals had reported falsely to the court. The wicked men told Evlavios that the generals had not put down the revolt, but on the contrary had joined the rebels, seeking to make themselves emperors. To make sure that their rumor reached the Emperor, the envious enemies of the three generals gave money to Evlavios to report it directly to him. Before Evlavios passed on the information to Emperor, he had the three generals arrested upon their arrival and locked them away until he had heard news from Phrygia. Hearing about the arrests and the anticipation of news from Phrygia, the jealous enemies of the generals feared that they would be exposed. In haste, they gave Evlavios more gold, persuading him that the generals should be quickly put to death. They scared the poor Evlavios with the notion that the generals might contact their rebel armies to storm the palace and set them free! Although he was conflicted about the situation, the frightened Evlavios reported the alleged treachery to the Emperor. Emperor Constantine, a man of action, was quick to assume what he had been told was the truth and ordered the execution of the alleged traitors. The faithful generals were in disbelief. They had always seen themselves as fiercely loyal subjects of the Emperor and his most trusted commanders. Upon awaking, Emperor Constantine met with Evlavios who had also been visited in the night by the angered saint. The two of them decided to head over to the cell of the imprisoned generals and investigate. “Dear Emperor, we weren’t casting spells! We would never use magic against our Emperor! In the name of God, we were brought up by our parents to respect God first and our Emperor second.” The generals continued to tell the Emperor what had happened to them on their voyage and how they came to pray on the subject of their miserable fortunes. “Why it was Saint Nicholas!” they all replied. The Emperor gave two gold candlesticks and a gold-plated Bible engraved with precious stones to the three generals. In gratitude, the generals delivered them to the cathedral in Myra where all three became monks and gave up all their possessions to the poor. Saint Nicholas welcomed them joyfully and brushed away all praise directed to him unto the Lord. And thus, the oldest of the triple-miracle myths of Saint Nicholas came to an end. Once upon a time there was an Emperor named Diocletian who launched a persecution against the Christians of the Empire. All those who failed to offer a pinch of incense to a pagan altar were sentenced to imprisonment. Many refused, including a very devout Christian named Nicholas. Captured by the authorities, Saint Nicholas was put into a prison where he was mocked, starved, and beaten. Reportedly, the Saint was said to have encouraged his fellow prisoners to stay strong and not lose hope. As the years changed, so did the Emperors. After a civil war, the Emperor Constantine made Christianity the state religion and pardoned all Christians imprisoned because of the persecutions, including Saint Nicholas. Upon his release, the saint journeyed to the temple of Artemis in the outskirts of Myra. Within the center of the forest-temple, the Saint knelt in silent prayer to the Lord. To which the Saint replied, “Go to Hell’s fire, which has been lit for you by the devil and his crew.” and all the temples of Artemis in the area were torn asunder. These stories were taken from Martin Ebon’s Saint Nicholas: Life and Legend, a delightful read which describes the stories of Saint Nicholas (A.D. 270 – 343). The photo shows, “Saint Nicholas Saving Three Innocents from Death,” by Ilya Repin, painted in 1888. This entry was posted in Features, History and tagged Byzantium, Christianity, History, West. Bookmark the permalink.